"Moresnet" redirects here. For other uses, see Moresnet (disambiguation). Neutral Moresnet (French pronunciation: ​[mɔ.ʁɛ.nɛ]) was a small Belgian–Prussian condominium in central-western Europe that existed from 1816 to 1920 and was jointly administered by the United Kingdom of the Netherlands (Belgium after its independence in 1830) and the Kingdom of Prussia. After 1830, the territory's northernmost border point at Vaalserberg connected it to a quadripoint shared additionally with the Dutch Province of Limburg, the Prussian Rhine Province, and the Belgian Province of Liège. 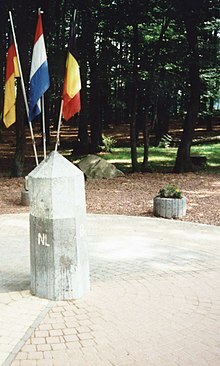 Today it is known as the Three-Country Point, being the meeting place of the borders of Belgium, Germany, and the Netherlands. During the First World War, Neutral Moresnet was annexed by Germany, although the allies did not recognise the annexation. The Armistice between France and Germany in November 1918 forced Germany to withdraw from Belgium and Neutral Moresnet. A year later, the Treaty of Versailles awarded Neutral Moresnet to Belgium, effective 10 January 1920, when the territory was annexed by Belgium to become the municipality of Kelmis. The area is especially of interest to Esperantists because of initiatives in the early 20th century to found an Esperanto‑speaking state, named Amikejo (lit. Place of Friendship), on the territory of Neutral Moresnet. During World War II, Kelmis and the surrounding area was again annexed by Germany and had its name reversed to Moresnet, but the territory was returned to Belgium in 1944. After the demise of Napoleon's Empire, the Congress of Vienna of 1814–15 redrew the European map, aiming at creating a balance of power. One of the borders to be delineated was the one between the newly founded United Kingdom of the Netherlands and the Kingdom of Prussia. Both parties could agree on the larger part of the territory, as borders mostly followed older lines, but the district of Moresnet proved problematic, mainly because of the valuable zinc spar mine called Altenberg (German) or Vieille Montagne (French) located there. Both the Netherlands and Prussia were keen to appropriate this resource, which was needed in the production of zinc and brass—at that time, Bristol in England was the only other place where zinc ore was processed. In December 1815, Dutch and Prussian representatives convened in nearby Aachen and on 26 June 1816, a compromise was reached, dividing the district of Moresnet into three parts. The village of Moresnet itself would become part of the Dutch province of Liège, whereas the Prussian village Moresnet (renamed Neu-Moresnet after World War I) would become part of the Prussian Rhine province, and the mine and the adjacent village would become a neutral territory pending a future agreement. The two powers, both barred from occupying the area with their military, established a joint administration. When Belgium gained its independence from the Netherlands in 1830, the Belgians took over the Dutch role in Neutral Moresnet (though formally the Dutch never ceded their claim). Formal installation of border demarcation markers for the territory occurred on 23 September 1818. The territory of Neutral Moresnet had a somewhat triangular shape with the base being the main road from Aachen to Liège. The village and mine lay just to the north of this road. To east and west, two straight lines converged on the Vaalserberg. The roads from Germany and Belgium to the Three‑Country Point are named Dreiländerweg (lit. Three Countries Way) and Route des Trois Bornes (lit. Three Border Stones Road) respectively; the road from the Netherlands is called Viergrenzenweg (lit. Four Borders Way). Some hold that the colours were taken from the two conflicting powers' flags, with black and white standing for Prussia and white and blue for the Netherlands. According to Flags of the World, "it seems more likely that the colours have been taken from the emblem of the Vieille Montagne [mining company]". The territory was governed by two royal commissioners, one from each neighbour. Eventually, these commissioners were commonly civil servants from the Belgian Verviers and the Prussian Eupen. The municipal administration was headed by a mayor appointed by the commissioners. The Napoleonic civil and penal codes, introduced under French rule, remained in force throughout the existence of Neutral Moresnet. However, since no law court existed in the neutral territory, Belgian and Prussian judges had to come in and decide cases based on the Napoleonic laws. Since there was no administrative court either, the mayor's decision could not be appealed. In 1859, Neutral Moresnet was granted a greater measure of self-administration by the installation of a municipal council of ten members. The council, as well as a welfare committee and a school committee, were appointed by the mayor and served an advisory function only. The people had no voting rights. Life in Neutral Moresnet was dominated by the Vieille Montagne mining company, which not only was the major employer but also operated residences, shops, a hospital and a bank. The mine attracted many workers from the neighboring countries, increasing the population from 256 in 1815 to 2,275 in 1858 and 4,668 in 1914. Most services such as the mail were shared between Belgium and Prussia (in a fashion similar to Andorra). There were five schools in the territory, and Prussian subjects could attend the schools in Prussian Moresnet. Living in the territory had several benefits. Among these were the low taxes (the national budget being fixed at 2,735 fr. throughout its history), the absence of import tariffs from both neighbouring countries, and low prices compared to just across the border. A downside to their special status was the fact that people from Neutral Moresnet were considered to be stateless and were not allowed a military of their own. However, there is no record of Neutral Moresnet taking a hostile international stance. Many immigrants settled in Moresnet so they would be exempt from military service, but in 1854 Belgium began to conscript its citizens who had moved to Moresnet, and Prussia did likewise in 1874. From then on, the exemption applied only to descendants of the original inhabitants. Neutral Moresnet did not have its own currency. The French franc was legal tender. The currencies of Prussia (and then Germany, after 1871), Belgium and the Netherlands were also in circulation. In 1848 local currency began circulating, though these coins were not considered the official medium. The Three-Country Point on the Vaalserberg today. Until 1915 this was also the location of Neutral Moresnet's apex. In 1886, Dr. Wilhelm Molly (1838–1919), the mine's chief medical doctor and an avid philatelist, tried to organise a local postal service with its own stamps. This enterprise was quickly thwarted by Belgian intervention. A casino was established in August 1903 after Belgium had forced all such resorts to close. The Moresnet casino operated under strict limitations, permitting no local resident to gamble, and no more than 20 persons to gather at a time. The venture was abandoned, however, when Kaiser Wilhelm II threatened to partition the territory or cede it to Belgium in order to end the gambling. Around this same time, Moresnet boasted three distilleries for the manufacture of gin. The most remarkable initiative occurred in 1908, when Dr. Molly proposed making Neutral Moresnet the world's first Esperanto‑speaking state, named Amikejo ("place of friendship"). The proposed national anthem was an Esperanto march of the same name, set to the tune of "O Tannenbaum". A number of residents learned Esperanto and a rally was held in Kelmis in support of the idea of Amikejo on 13 August 1908, and a coat of arms was unveiled. The World Congress of Esperanto, meeting in Dresden, even declared Neutral Moresnet the world capital of the Esperanto community. However, time was running out for the tiny territory. Neither Belgium nor Prussia (now within the German Empire) had ever surrendered its original claim to it. Around 1900, Germany, in particular, was taking a more aggressive stance towards the territory and was accused of sabotage and of obstructing the administrative process in order to force the issue. The First World War brought about the end of neutrality. On 4 August 1914, Germany invaded Belgium, initially leaving Neutral Moresnet as "an oasis in a desert of destruction". A total of 147 Neutral Moresnet citizens were killed, though it is unclear whether they were killed inside the territory or in fighting outside its borders. On 27 June 1915, Neutral Moresnet was annexed by the Kingdom of Prussia, although the annexation never received international recognition. In 1918, the Armistice between France and Germany, signed on 11 November at Compiègne, forced Germany to withdraw from Belgium and also from Moresnet. It also led to the ousting of Mayor Wilhelm Kyll, a German national who had been appointed after the German invasion. On 28 June 1919, the Treaty of Versailles settled the dispute that had created the neutral territory a century earlier by awarding Neutral Moresnet, along with Prussian Moresnet and the German municipalities of Eupen and Malmedy, to Belgium. The treaty became effective on 10 January 1920, ending the territory's existence and turning it into a municipality in Belgium. To distinguish it from the already existing town of Moresnet (in the neighboring municipality of Plombières), Neutral Moresnet was renamed Kelmis (in French: La Calamine) – after kelme, the local dialect word for zinc spar. Despite the annexation, Neutral Moresnet Mayor Pierre Grignard effectively stayed in office and became the first mayor of Kelmis. The ten members of Neutral Moresnet's council were confirmed for the Kelmis municipal council after its Prussian members renounced their nationality. They remained in office until the election of a new municipal council on 7 February 1923. After 1920, Moresnet shared the history of Eupen and Malmedy. Germany briefly re‑annexed the area during World War II, but it returned to Belgium in 1944. Since 1973, Kelmis has formed a part of the German‑speaking community of Belgium. 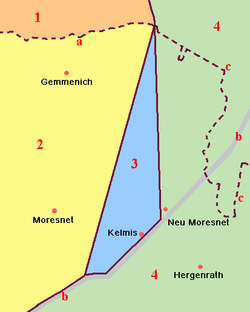 In 1977, Kelmis absorbed the neighbouring communes of Neu‑Moresnet and Hergenrath. A small museum in Neu‑Moresnet, the Göhltal Museum (French: Musée de la Vallée de la Gueule), includes exhibits on Neutral Moresnet. Of the 60 border markers for the territory, more than 50 are still standing. As a company, Vieille Montagne survived Neutral Moresnet. It branched out and after two centuries continues to exist as VMZINC, a part of Union Minière, the latter renamed in 2001 as Umicore, a global materials company. On 26 October 2016, Catharina Meessen became the last surviving citizen of the former territory after the death of Alwine Hackens-Paffen. ^ Martin, Lawrence; Reed, John (2006). The Treaties of Peace, 1919–1923. 1. Lawbook Exchange. p. 46. ISBN 978-1-58477-708-3. LCCN 2006005097. Neutral Moresnet, added to this map as an independent country, is a mile [1.6 km] wide and 3 miles [4.8 km] long. It is so small that it has never been shown on maps of Europe as a whole. It has an area of 900 acres [360 ha] and about 3500 people . . .
^ a b "VMZINC : un leadership enraciné dans l'histoire". Qui sommes nous? (in French). VMZINC. Retrieved 24 October 2008. ^ "Route 4: Landgraben" (PDF) (in French). GrenzRouten. 2009. pp. 45–46, 49. Archived (PDF) from the original on 15 March 2016. ^ Sache, Ivan; Sensen, Mark (1 May 2005). "The Neutral Territory of Moresnet (1816–1918)". Flags of the World. OCLC 39626054. Archived from the original on 28 September 2015. ^ Damen, Cees. "Coins". Neutral Moresnet. Archived from the original on 4 November 2008. Retrieved 24 October 2008. ^ a b c d Hoffmann, Eduard; Nendza, Jürgen (19 September 2003). "Galmei und Esperanto, der fast vergessene europäische Kleinstaat Neutral‑Moresnet" (PDF) (in German). Südwestrundfunk. Archived (PDF) from the original on 15 March 2016. Retrieved 15 March 2016. ^ "Awaiting a Crisis in Belgium" (PDF). The New York Times. 13 September 1903. ISSN 0362-4331. Archived (PDF) from the original on 15 March 2016. ^ a b Middleton, Nick (2015). An Atlas of Countries That Don't Exist: A Compendium of Fifty Unrecognized and Largely Unnoticed States. London: Macmillan. p. 38. ISBN 978-1-4472-9527-3. ^ Musgrave, George Clarke (1918). "The Belgian Prelude". Under Four Flags for France. New York: D. Appleton & Company. p. 8. hdl:2027/uc2.ark:/13960/t8qb9xr4b. LCCN 18003816. OCLC 1157994. OL 7209571M. As a proof of German preparation, war had come automatically at 7 a.m., 3 August . At 23 o’clock (Belgian time) the outposts on the main roads holding Pepinster, Battice, Herve and smaller hamlets, were heavily engaged and finally forced back to the fortified lines of [Liège]. The pretty towns defended near the frontier were soon flaming ruins, the quaint neutral territory of Moresnet rising as an oasis in a desert of destruction. ^ Berns, Eef (2002). "In search of the bordermarkers of Moresnet". Retrieved 1 September 2008. ^ "Dwergstaatje Neutraal Moresnet heeft nog slechts één oud-bewoner". Trouw. 5 November 2016. Retrieved 20 March 2017. Earle, Peter C. (2012-08-04). "Anarchy in the Aachen". Mises Institute. Retrieved 2017-09-07. Wikimedia Commons has media related to Neutral Moresnet. This page was last edited on 20 March 2019, at 04:25 (UTC).